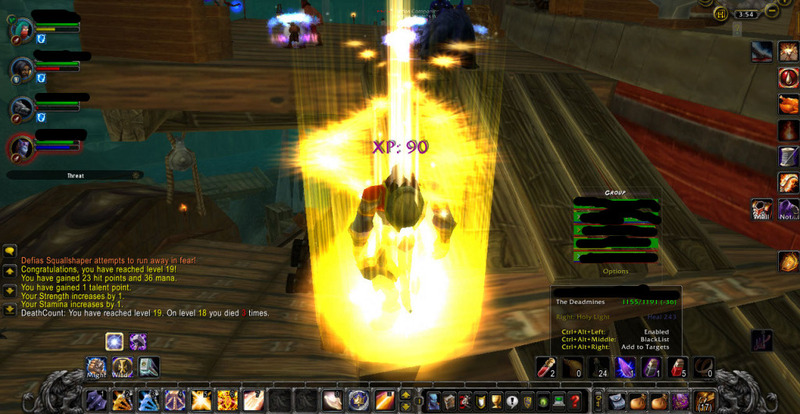 Mishalom, Pally of the Pugs, is trying to get to the WoW level cap using only the LFD tool in WoW! This idea is based off of the original Pugging Pally, Vidyala! I popped in for a ‘quick’ run on Mishalom, after more than a month or so of not playing on him (and feeling guilty about that — on a side note, I’m now writing this months later. You’re lucky I have an awesome memory took good notes). Being level 17, I anticipated either RFC or Deadmines. The starting group was mostly levels 16 or 17, with a 19 druid dps, just to mix it up. The tank was a warrior, and I know there was also a rogue. The other dps I don’t recall, as eventually through the run they began to drop and enter like mad. Not that they were leaving because the run was going poorly. I might have been tempted to leave too, if not for remembering the golden rule I broke last time. I told myself I’d stick to it, even if it killed us. Now, I’d like to call myself a good healer. I’m just fine healing with Misha, or so my guildies tell me, and I think I’m a good healer on my other non-shaman toons. But low-level paladin healing is a different ball game. There’s not much you can do — it’s literally just Holy Light*, the longest and most expensive paladin heal. Getting a second healing spell will really make my day (level 20 can’t come sooner!). So I’m not sure if it’s just the paladin healing mechanics at this level or if it’s me. I wonder if I would have similar healing challenges as a low-level shaman, since all they have is Healing Wave… but I don’t have one of those to experiment with. 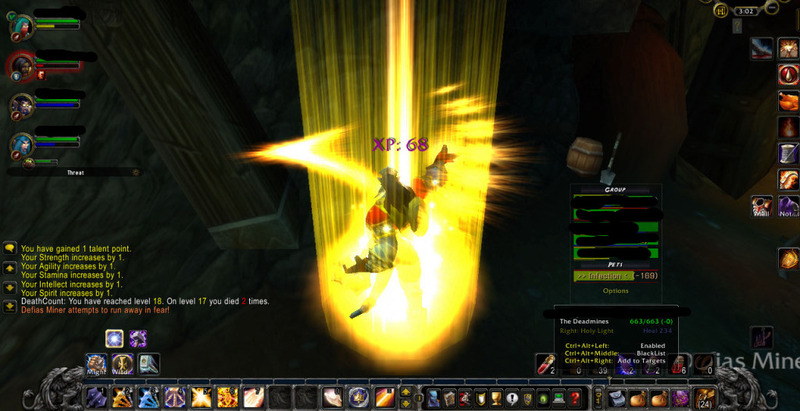 If you healed a dungeon as a resto shaman from 15 to 19, let me know how it went for you. Anyway, besides that fact Mishalom drank vast quantities of melon juice to keep his mana up… it turned out the tank wasn’t very good either. His heart was in the right place (he too stayed through the whole instance), but there were many bad pulls with too many mobs, bad positioning, and lack of holding threat. Here’s some math for ya: 1 barely at-level tank (for that instance) who isn’t good, plus 1 barely at-level healer (for that instance) who can only throw like 2 healing spells before going oom = death for all. Names are redacted to protect the innocent. And it appears that other dps I didn't remember was a hunter! I’m sure the mana from the ding didn’t last long. After we beat the first boss in the shredder, the rogue repeatedly asked if we could reset the instance and run again, because their loot (some sort of weapon, I think) didn’t drop this time and could we pleeease please please go again please omg. We declined to requeue. (I forget if the rogue dropped because we refused his request or not). We then proceeded to the goblin forge area, where we had our first wipes (partial and full). As I’ve mentioned before, that area always seems to give groups trouble, and our inexperienced tank managed to make quite a few bad pulls in a row that left me completely oom. I think the only reason why we didn’t completely wipe the second time was because the dps druid also healed and tanked (though not all at the same time!) But he was very flexible in his roles, which I really appreciated due to my almost constant lack of mana. If you are in Deadmines on the docks directly next to the ship and the group begins to wipe due to extra mobs being pulled, hop onto the nearby water wheel! 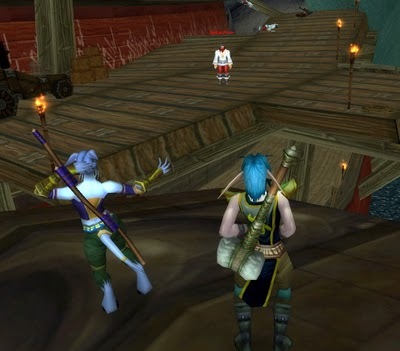 The mobs will not follow you onto the wheel and will loose interest, at which point you can hopefully rez the dead and try again. Of course, I learned this tip (or rather, re-remembered it) by dying a horrible horrible death (along with a few other members of the group) and watching the druid and another dps remember about the wheel. Their knowledge of the wheel let us recover from the wipe without having to run back, which is good, because the overpull wasn’t completely the tanks fault. I still maintain that the positioning of the mobs on the ship does not bode well for lower level tanks. Of course, the wheel can’t always save you — sometimes it’s too far away from where you’re fighting, or people die in unrezzable locations and have to run back, or only non-rezzers hopped up there and then the rest of the party has to run back. Splitting the party in Deadmines is never a good idea because there always seem to be patrols that have spawned behind you, and then the rest of your group can’t make it up to you because there are some pats in the way. Palintera and Linn, as mentioned in Need More Rage, have safely escaped the wrath of the pirates via clever jumping maneuvers onto the wheel of salvation. If you’ll note the ramp in the distance, that is usually where pulls go bad, if not sooner near the walkway in the lower right hand side. If the mobs are clear on the deck and the corpses of your teammates are nearby, it’s an easy wipe recovery! Otherwise you’ll most likely have to die and run back. But that was the last hiccup of the run. We cleared the rest of it with no other major problems, and I got my Deadmines achievement. Whoo! Deadmines Completed! And you'll see that versitile druid tanking, and me running out of mana (as usual). And better yet — somewhere on that pirate ship I dinged! Oh look! There's the wheel down below! Here are the stats from this time around. Going up two levels in one run isn’t bad, even if it used all my rest xp. (Luckily it’s been months since I last signed on Mishalom, so he should be full again). *Technically I have Gift of the Naaru because I am a cheating Draenei, but if I was a normal paladin it would only be Holy Light. Besides, it has a long enough cooldown that it can be ignored, right? (Though it really can help out in a pinch). It was over a month ago that I last played on Mishalom (and I’ll be posting this even later), so the PUGs aren’t the only thing I’m failing on. Fortunately, I left some handy cliff notes for myself, and I recorded my current stats, since I wouldn’t remember otherwise. My memory is like a sieve. However, even without the cliff notes, I still feel a bit guilty for what happened. Let me explain. (I’d continue the quote, but this 1000+ word post is a little long to be called a summary). It was an afternoon on a weekend; I had some time to kill before going out with The SA that evening, so what better way than queuing up from some random dungeons with the mini-pally? And since he was only 16 at the time, there would be plenty of time to go through several random dungeons. Because, you know, the only thing you get is RFC. And that takes forever. (SARCASM ALERT). So the queue pops up for the random dungeon after a minute or two, and I accept, as a healer (per ze rules!) And that little window pops up saying who’s accepted… dps, dps, dps, me (healer)… but not the tank. And I immediately thought to myself, “Gee, that’s weird. Tanks always get insta-queues – why would they not accept the dungeon right away?” I couldn’t really imagine any situation where that would happen (I mean, maybe an emergency of some sort that happened exactly when they hit the queue button…), but I wasn’t left pondering too long, because at the very last second the tank accepted the dungeon. “Oh well, we’re in the dungeon now,” I mused, carefully noting that the dungeon in question was indeed RFC. We all loaded in, and before I even got a chance to start deciding how to buff people, the tank charged in. I’m used to those types of tanks, but it was a little annoying (read: very annoying), because I like warning people that I need to drink a lot as an itsy-bitsy healing pally without heirloom gear (and only one healing spell). And when I say charging in, I mean he went and pulled 5-6 mobs. In RFC, that means you go pretty far down the hallway to get that many for your first pull. I’m trailing behind, mentally cursing chain-pulling tanks… when the tank intentionally leaves the group. That’s right, dude has 5-6 mobs and then drops group. That’s right; since I actually bothered to keep up with him and heal him against my better judgment, all the mobs came right for me. As any healer in this situation would do, I immediately backtracked. Some of the dps started to help take out the mobs, at which point I stopped running like a sissy and healed them like crazy. 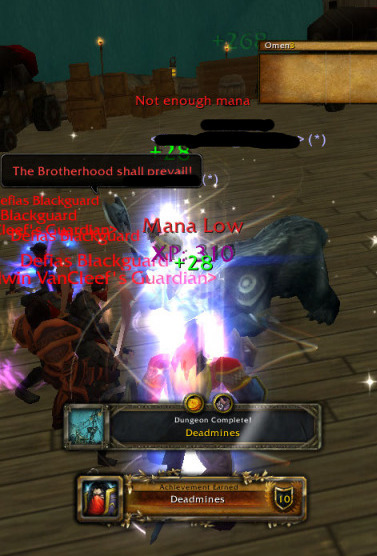 We probably would’ve taken care of the mobs as well, but a fast thinking fellow in group requeued us – heck, I don’t even know if someone actually had to manually requeue us or if it happened automatically. All I know is I got a little dialog box up which I clicked madly between heals, and then was deposited in Deadmines. If your tank takes excessively long to enter the dungeon queue, and then pulls as many mobs as possible, don’t follow them and don’t heal them! 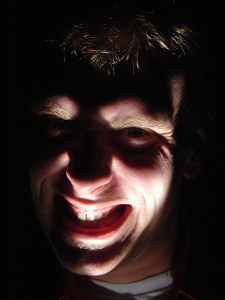 They’ll either learn to not run ahead of the group, or they were planning to kill-by-absence and therefore it would be best if you didn’t have aggro. And I haven’t even gotten to the part where I feel guilty! Anyway, the remainder of the group was now in Deadmines, the new instance. I was a little worried, because I was 16, one of the lowest level characters there. And being the lowest level as a paladin healer in these earlier levels is never good. The group (3 from the original RFC group, actually — one of them left besides the tank, though I don’t remember exactly when) actually worked pretty well together. I had to drink often, but we got all the way to the pirate ship with little incident (I think we may of had some issues in the goblin forge room, but that’s usually a 50/50 75/25 90/10 chance as to whether something bad happens there or not). However… once we got to the pirate ship, we ended up wiping completely. Twice. (My first deaths, I might add!) One time it was my fault too. You know how there are multiple levels to the pirate ship? And there are mobs on all the individual levels? Well, it turns out that when you’re of a certain level range (ie 15 – 17, or so), you are highly susceptible to accidentally pulling the upper-level mobs, merely by walking near their platform. Or underneath their platform. Or looking funny at the platform. Yes, it’s that bad, and I have experienced it before on other characters. With Mishalom, I wasn’t able to keep the distances that I needed to not pull those upper level mobs while still healing the group (it’s harder than it seems on the narrow ramp). And all those extra mobs on the top of the ship + the ones you’re fighting + low-level pally healer = death for all. Add that to the ‘tank-leaving-the-group’ problem from before, and you have a frustrated healer. Worst of all, I had to bail. That’s what I feel the most guilty about – not seeing the whole dungeon through, like I planned that I would for all of Mishalom’s instances. It’s even in the rules, see? (For those of you wondering, this is the rule I alluded to earlier when I mentioned I broke one of the rules). I can justify it to myself, of course, because at that time of the last wipe The SA arrived to run some errands with me, so I had to go right away. I did inform the group of my intent to leave after the wipe… and I probably would’ve just get the upper level pulled again, if I had stayed. More annoyingly, I know I would have finished the run with plenty of time if it had been the RFC we were in. But I guess that’s what happens when I assume that I’ll always get RFC at the lower levels. At least now I’m making sure I have plenty of time to finish whatever PuG the random dungeon finder brings me — I just need to remember that dungeons weren’t always designed to be run in under half an hour! Either way, I did ding, so that’s always good. Deaths: 2 (+2) Daw, my first deaths. Today’s post is a Blog Azeroth Shared Topic post for July 5-10. This shared topic was brought up by Ecclesiastical Discipline, who asks “When should a healer let somebody die?”, a question thought of when they wrote about how healers rule five mans. My main, Mishaweha, is a shaman healer. I love healing; I leveled resto (before that LFD system, mind you! ), which in retrospect was a very painful, slow way to level (I seem to have blocked out most of my memories on the matter). But it means that I have plenty of experience healing dungeons and raids… and letting people die in them. Now, in my experience, there are different reasons why a healer let’s somebody die. For the purposes of this post, I will classify these reasons into three different categories: Accidental, Prioritized, and Purposeful. I’ll explain what types of deaths constitute each category, and how often I let those happen when I heal. I believe that this category is the most common reason why people die in WoW dungeons. I would assume that every healer has the goal of keeping everyone alive — not only is it their job, but it also keeps the group moving. But sometimes there are… accidents while going through a dungeon. I’ve classified these accidental deaths in sub-categories for your enjoyment. The dungeon is going swimmingly, no one is taking unexpected damage, you’ve got the mouse posed right over the your healbot-like interface (or whatever you use to heal), and the HoTs are rollin’ (if you’re lucky enough to have HoTs. Stupid druids). But then something interesting pops on the telly, or that blog post your reading is really engrossing, or that youtube video got to the really funny part, or your parents/friends/roommate/S.O. demand your attention for just a moment… Whatever the reason, you become ‘momentarily’ distracted, and that’s when everything hits the fan. The tank pulls too many mobs, randomly gets hit hard, aoe plagues the group, and people start dropping like flies. If you notice soon enough, it usually can be recovered from, but this can lead to a wipe. Pulling in 5… 4… NOW! This is similar to an AFK-Healer, as you could have been AFK. But most likely you were just unprepared for the pull — the tank charged in without buffs/HoTs/a readycheck. And then they go SPLAT, along with the rest of the group that has aggro, which may or may not include you. I’ve usually encountered this on in raids, where the tank missing buffs and HoTs is more important, such as XT, Razorscale, and more recently, Marrowgar. These fights do call for some positioning at the start, which means HoTs buy me some time to get settled into my position and getting my totems down, since I typically don’t focus on healing until after I get situated. That’s why the HoT helps, and when it’s not there tanks go SPLAT way more often. Hey guys — Wait up! Oops! There you were, refilling your mana, looting, or gathering, when the tank just went right on ahead! Now they (and everyone else) are too far ahead to heal, no matter how fast you run! 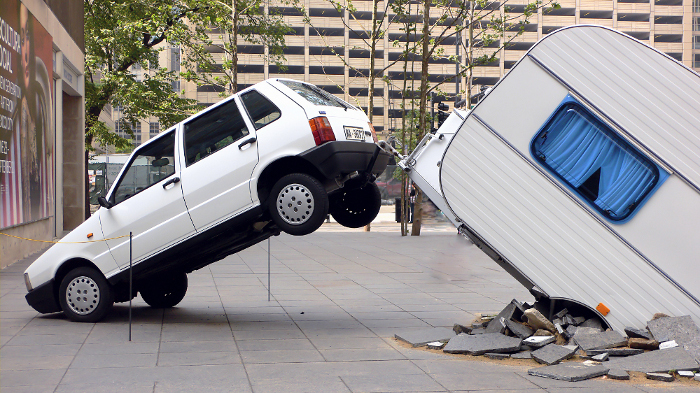 This is sometimes a salvageable situation, but often leads to a wipe. This can also happen when the group splits up in a dungeon on accident, leaving you to pick which group to save and which group went the wrong way (hint: if the tank isn’t with you, you went the wrong way). A similar situation is when a single character (or a small group of them in a raid) happens to be too far away for you to heal due to fight mechanics. In lower level dungeons, I’ve had this happen when a dps (or two) get the notion that they are also tanks, and therefore should lead the group in the opposite direction of the tank. I usually stick with the tank, though, so the dps end up dying if they’re too far away for me to run between both groups. The raiding situation is common enough, but usually doesn’t end up with someone dying. Death does occur every now and then, when a single dps runs to that side to avoid killing the group, and you’re on this side with a giant wall of fire in between. That poor, poor soul you were trying to heal, with just that sliver of health left, died right before your cast went off. 2 seconds are wasted, possibly leading to a wipe (if it was the tank) and makes you forever question why you chose the extremely long cast time heal instead of the faster one. It’s ten times worse if it was an aoe heal that was going to save everyone around that person too, but now they all die in the same manner as you keep picking the wrong one to try to save. This often leads to you giving up on healing the really low health targets, and aiming an aoe healing spell on the ones that won’t die in (cast time) – .1 sec. Not that’s ever happened to me before while I chain heal a melee during aoe attacks on the group. Nope, never. Similar to the above situation where your direct heal failed due to death, this situation is when your aoe heal, which you were sure would hit “that guy who’s almost dead”, does not get to them, leaving them rather dead, in most cases. For me, this happens when I send a chain heal to a ranged person, thinking they might be standing next to another ranged person who also needs heals… but they’re not! (See “The Hunter” diagram for further explanation of the situation). I don’t know if other classes have aoe heals dependent on where folks are standing, but sometimes it’s rather frustrating! Raid damage is everywhere and you can’t keep up! Similar to the ‘Holy Damage Batman!’ but it’s everywhere, not just from a boss switching targets. XT used to be like this for me when I was raid healing, especially before it was nerfed. It’s a lot of damage going around, and if you hadn’t topped everyone off from the start… well… they were likely to be a goner. This situation often leads to an “Almost done casting” scenario. As in, you were given the lowest priority, and now you are a floor tank. All deaths in this category can actually be considered Accidental Deaths, since again, they weren’t intended. But this category is focusing on a particular thought process where the healer purposefully chooses someone else to live. These types of prioritizations often happen when there is a “Healing Overload” — A large number of targets are taking damage, and you know you can’t save them all. Who do you choose? You’ll note that there is no end to the flowchart. That’s because a healer must always go through and recheck this list at all times in order to be effective. It’s not much help if you heal up the tanks and move onto the dps only for the tanks to flail and die a few seconds later. Priorities like this are why dps always seem to drop first, but that’s because they are only slightly more expendable than other tanks and healers. If your tank dies, well, that’s pretty much a wipe unless you’re in that last one or two percent that you can burn off while everyone drops like flies. You can get by with less healers, but it makes the job harder for yourself, when there are less of you, and usually leads to a wipe (especially if you end up solo-healing). However, if you lose one or two dps, you still have a good chance to kill the boss, especially if the ones with higher dps are still alive. However, it’s still not optimal to lose lots of dps, as the others have to make up for the lost damage — and if they can’t make up for it? Death for all! I would opine that this type of death in WoW happens the least. This is when the healer purposefully does not heal a person, no matter what. It’s not an accident that they die, it’s not because they were given a lower priority — no, it’s because the healer has chosen not to heal them. Typically, I don’t purposefully let someone die. I have an itchy trigger finger when it comes to staring at my Healbot, so even if I don’t want to heal someone, I end up doing it anyway. They’re probably better off alive than dead, anyway. Joke – Most common in guilds, this is where the healer (and hopefully the rest of the group) decide to call of healing Player X. I would guess this would usually be the tank. I know our guild has a running gag of saying we’re not going to heal our main tank, even if we do. 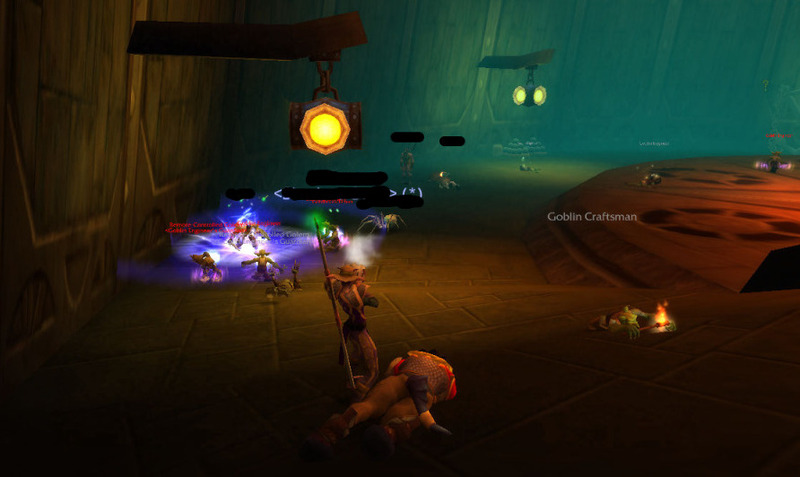 Refusal of Service – Most common in LFD PuGs, this is when the healer refuses to heal a certain player (or the whole group) until a particular condition is met. These conditions are usually pretty simple ones, like ‘stop acting like a jerk’ or ‘let the tank pull’. Personal Vendetta – Player V, for whatever reason, has ticked off the healer. If it was a LFD group, they probably let their mouth run off and that made the healer angry. Therefore, they get no more heals. (I’ve wanted to do this on several occasions, but I always end up going for the heal button anyway). I’m sure there are other reasons why someone would purposefully not heal someone, but that’s all I can think of for now. Since I typically always heal everybody due to my itchy healing trigger finger, I really don’t have much experience not healing people. Are these ‘categories’ accurate from your own healing experiences? Are there ones that happen more often for you? Have you ever purposefully not healed somebody? Have you ever been on the receiving end of no heals, or knowingly been on the ‘low-priority’ heals? Feel free to comment and let me know!